I have dry hair that always seems to break and fall out a lot. I always find lots of hair in my comb after I wash my hair. Lucky for me I also have hair that grows back fast so I don't miss the hair that is left behind. I get tired of combing my hair and having a big wad of it left it the comb. My hair also tends to clog the shower drain so I have to clean that a lot. I like my hair at the length it is so cutting it short is not an option. So what is a girl like me to do? I want healthier hair and my husband does not want my hair all over the house. 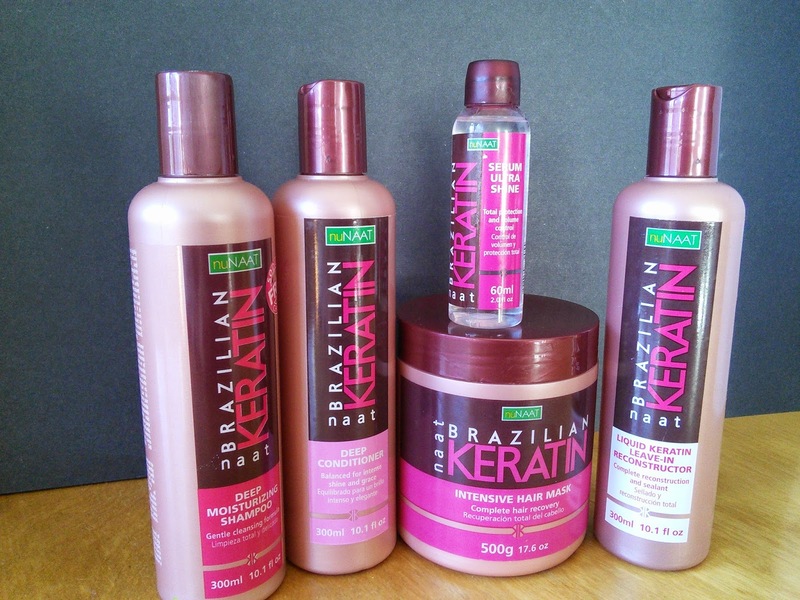 I started using a new product from nuNaat called NAAT Brazilian Keratin Daily Care. This collection of hair care products promises to to help repair and improve damaged hair. The very first time I used the NAAT Brazilian Keratin Deep Moisturizing shampoo and conditioner, I noticed that there was no hair in my comb after my shower. The NAAT Brazilian Keratin Liquid Keratin Leave-In Reconstructor that I put on my hair afterwards made my hair soft and took away my frizz. This product will be great when we get rain, as my hair gets real frizzy then. I was sent these products to review and I just had to know more about this nuNaat collection as I was loving the results after using the products. The NAAT Brazilian Keratin Daily Care collection comes with five products that contain green keratin which promises to repair damaged hair cuticles and seal them to make your hair healthy and resilient. These products work together to regenerate and strengthen hair fibers which results in hair that is soft and shinny. I love that these products are formaldehyde and sodium chloride free. They also work on all hair types and are made with natural ingredients. NAAT Brazilian Keratin Deep Moisturizing Shampoo The NAAT Brazilian Keratin Deep Moisturizing Shampoo is prepared sodium chloride free with mild surfactants (foaming agents), Green Keratin and amino acids all which provide a deep cleansing without being too abrasive. NAAT Brazilian Keratin Deep Moisturizing Conditioner The NAAT Brazilian Keratin Deep Moisturizing Conditioner contains high-capacity conditioning ingredients to make detangling a breeze. It works to reduce frizz and tame unruly hair. NAAT Brazilian Keratin Intensive Hair Mask The NAAT Brazilian Keratin Intensive Hair Mask can be used in place of the Deep Moisturizing Conditioner after using the Deep Moisturizing Shampoo. The mask will intensely hydrate and repair hair fibers. Leave in for 10-20 minutes before rinsing well. You can use this every 1-2 weeks as necessary. NAAT Brazilian Keratin Serum Ultra Shine Our NAAT Brazilian Keratin Serum Ultra Shine contains our special silicone formula that creates a film that protects hair against environmental damage, keeping it moisturized and providing extra conditioning, more shine and increased flexibility. You can apply this to your wet or dry hair, evenly distributing a small amount, as often as desired. Click on the below link for more information on these awesome products. You can also put your zip code in the store locator to see where to buy the products. I am able to buy them at Walgreens. Check out other nuNaat products that I have reviewed. "These opinions are my own and I was sent the above mentioned products to try out and give my honest opinion." This sounds like a great product! I may need to check more into it for me and my girls. We are shedding something awful around here. Nice!! I like their line alot!! I really like this shine product. It works awesome! Highly recommend it. Also love the mask too! I would love to see if this helps reduce the static electricity in my hair. I noticed it after the recent cold spells. I have seen this brand at the local health food store, but did not know that they had this Brazilian Serum. I also like the packaging design...very clean-looking. I love a good hair mask, and I definitely prefer a keratin product before heat styling. Thanks! Wash your hair less frequently. Try rinsing with room temperature green tea, and apply a hair mask like olive/coconut oil once a week. Brush your hair everyday to promote blood circulation. I like the product! Hope it will work. I don't know how it will fork for natural hair extensions. I would definitely recommend this to my friends in hair industry.